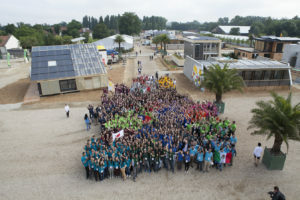 I just got back from a visit to Paris and was fortunate to be able to visit the Solar Decathlon in Versailles, a competition where some 800 students designed energy efficient, solar powered homes. Working in teams on a small site on the grounds of the Palais De Versailles, the students designed 20 houses along with some central services buildings, restaurants, electric vehicle charging stations and the like. It really was a city in miniature. As I’ve mentioned in previous posts, in his book “Third Industrial Revolution,” Jeremy Rifkin talks about the need for five pillars to enable a paradigm shift to a carbon free future: renewable energy, buildings that generate positive energy, electric vehicles, energy storage systems and a smart grid to handle the dynamic energy flow from renewable and EV charging. All five pillars were present and accounted for at the Solar Decathlon, along with one that Rifkin did not mention: inspired engineers. In this case, the engineers were all students and it struck me how important that fact was. Building cities that represent the third industrial revolution will naturally take years, so it will require young engineers who are inspired by the idea. It was great to see so many of them in action at the Solar Decathlon, and also to know that Schneider Electric, as a diamond sponsor, helped make it happen. The event also showcased rapid collaborative innovation. Back in January this year a small team from Schneider Electric gathered to plan how to implement the infrastructure that would support the Solar Decathlon contest. Building on the work they had done at Issy Grid, which is just up the road on the edge of Paris, the team decided to use some of the modules they had implemented there. They included Schneider Electric power distribution panels, surveillance cameras, building management controllers, electric vehicle chargers, inverters and people counters and software that collects data coming from all these devices. We also employed Internet connections from our partners, and cloud services from Microsoft to host the data and make it available to competitors and observers alike. Cloud services were also used to combine data from smart meters called Linky that the local utility (ERDF) installed at the site (which are also being rolled out across France) and from the Schneider Electric weather services that utilities around the world use to optimize their operations during weather incidents. In the words of Joris Gaudion, who lead the Schneider Electric team that pulled all of this together, they hacked a solution using Internet of Things technology with support from a virtual team of Schneider experts, global partners like Microsoft and local start-ups. At some point we will document the technical solution and publish it, but for now I prefer to see this as a tour de force of Schneider Electric’s capability to not only provide many of the products and services needed in a Smart City but also to knit the operational technology together with IT to make the information available to those who need it. For example, the smart phone app the team created in a few short weeks enabled visitors and competitors to view the live energy consumption and production at the houses, along with pictures and live video. Despite the alarmist language some use to describe the threat of climate change, I have always been optimistic about our ability as a human race to find innovative ways to mitigate the effects of climate change, and my optimism was reinforced by my visit to Versailles. Thanks to powerful collaboration between partners and an entrepreneurial spirit among young engineers to develop new solutions, the Solar Decathlon was a great success. More importantly it showed us the way to harness renewable and green technology blended with state of the art IT to enable a more sustainable future. Finally, congrats to Team Italy, from Universita degli Studi di Roma TRE, for its first-place finish in the Decathlon.